I've been visiting Spain for forty years. During that time I've seen a lot of the country. 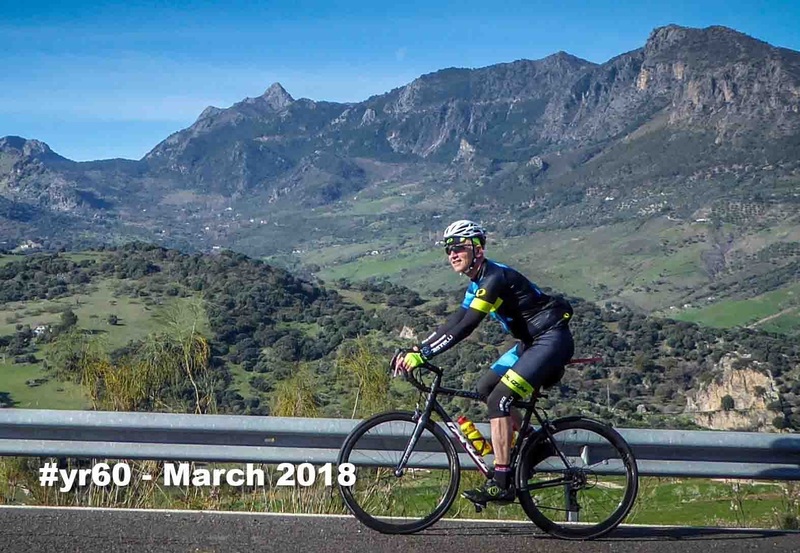 I've mountain-biked in Extremadura, climbed hiked and cycled the Pyrenees, ridden the ancient pilgrim route to Santiago, and spent many, many weeks living between Valencia and Alicante where my parents lived and died. Andalusia had escaped my attention so I decided this was the month to rectify this oversight. 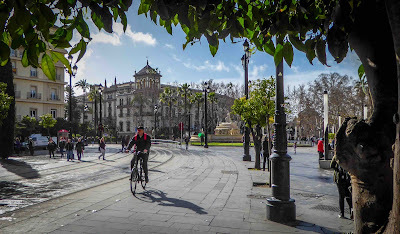 I would combine a cycle training camp with a visit to some of the great Andalusian cities of Granada, Ronda and Seville. I decided I would not take the training camp too seriously - after all I'm not training for anything - so I could mix the riding with city exploring. 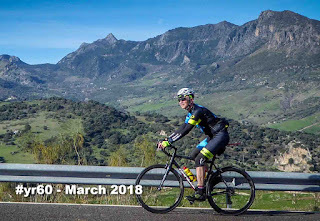 I looked at a few companies offering camps, and decided to go with Andalucian Cycling Experience. They had great reviews, promptly replied to emails, the dates worked but in truth, the main reason was their location. From their Montecorto base I could easily reach Ronda and Seville. 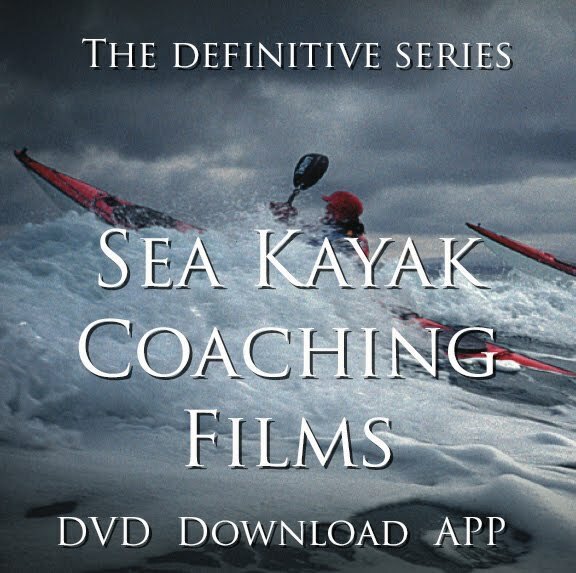 To save you hunting, the others were Wheels in Wheels, Epic Cycling, Cycle Sierra Nevada, and Custom Cycle Coaching. 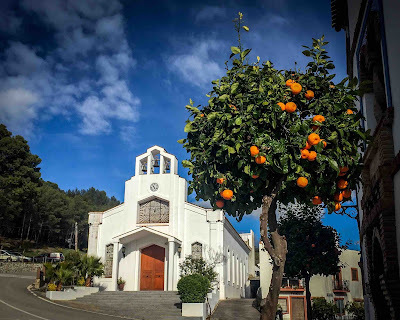 The experience of cycling in Andalucia deserves a separate post which I shall write. However, just getting to the lovely village of Montecorto proved a challenge worthy of my #yr60 programme! This was the cunning plan. I don't have a bikebox, so planned to borrow one from my friend Allister in Northumberland. I'd stay with him overnight, leave the car, and he'd drive me to Newcastle airport for the Malaga flight early Saturday morning. The 'Beast from the East' weather hit the UK days before I left home in North West Scotland. "Stay in your homes", was the advice. EasyJet cancelled all its Friday flights from Newcastle. Hotels were full to overflowing. Allister had to walk five miles home through deep snow because there was no way to get up his track. Suddenly my Andalucian Cycling Experience was looking doubtful. Is it a sledge or bike box? I set off from home early Friday morning. The Amber weather warning across Scotland's central belt switched to Yellow as I reached it and I sailed through. While the side roads were snow-choked, the main roads were clear and, with relatively few cars using them, I made it to Newcastle Airport Hotel in a little over five hours - that's actually faster than normal. Meanwhile, Allister had sledged the bike box down his track and met me at the hotel which I'd reserved on Booking.com the moment the weather looked doubtful. When I reached Montecorto I discovered I was the only person on this cycle training camp! Two other riders had postponed their trips (there was only ever three of us) so I had the town-house and cycle guide Drew all to myself. Initially I was slightly narked by this - one of my reasons for coming had been to ride and hang out with other cyclists. As it was it worked out very well. I was also rather lucky. Allister had given me a ratchet compression strap to wrap around and secure the Polaris Bike Pod box. At the other end, the strap had disappeared, along with the luggage tag identifier that the airline had wrapped around it. 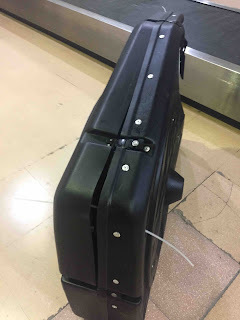 These straps hold ladders of car roofs and simply do not snap, so it must have been cut off by baggage handlers. Also one set of cable-ties had snapped, and two of the locks on the bike box pinged open, putting enormous strain on the remaining catches. I was lucky the bike and contents survived. This was the second time a Polaris Bike Pod had sprung open on me. For the return I had it 'wrapped' in a thick clingfilm-like wrapped in the departure hall which added €20 to the flight but meant it arrived intact. 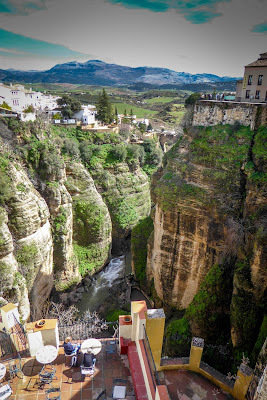 Andalucia might have escaped the snow but it had suffered storms. The previous week's cyclists missed a few days riding because of torrential rain and especially high winds. It was completely unseasonable for this part of the world, and while it moderated, the rain hadn't entirely disappeared. So we switched days around to suit the weather. When it was raining hard in the mountains, I headed north to explore Seville. There's a single-line metro and it's easy to drive to a large well signed park-and-ride and take the train into the centre. Andalucia had also been hit by storms and all the city parks were closed for clear-up crews to work. 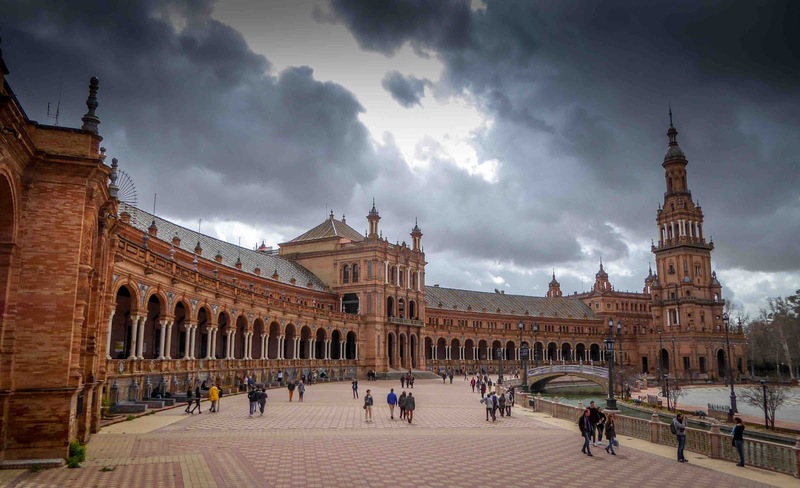 I'd identified three 'must-do' sights in Seville. 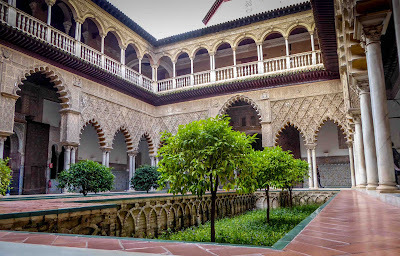 The Real Alcazar is an Moorish fort/place which is now the royal residence in the city. The cool architecture, designed for summer days over 40C, was harder to appreciate in the chilly temperature, but the beauty shone through. There were a surprising number of tourists too. So many tourists that the queue to get into the cathedral was just too long to contemplate, so I walked to the third on my list, the Plaza Espana. I remember the publicity around 1992 Seville Expo and considered taking the metro out to the site, but saw photos showing it was pretty much wasteland. 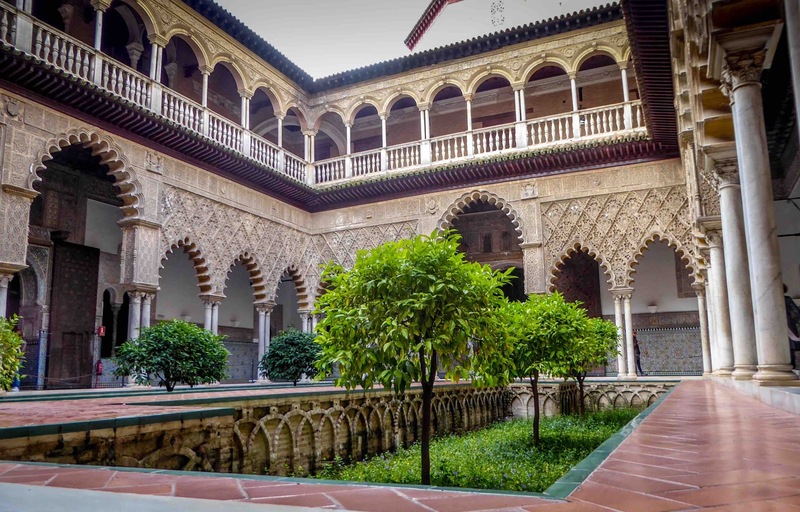 I was slightly underwhelmed by Seville. I'm not sure why. Perhaps it was the temperature? It's a city designed for the heat of the sun. Whereas Ronda is impressive. 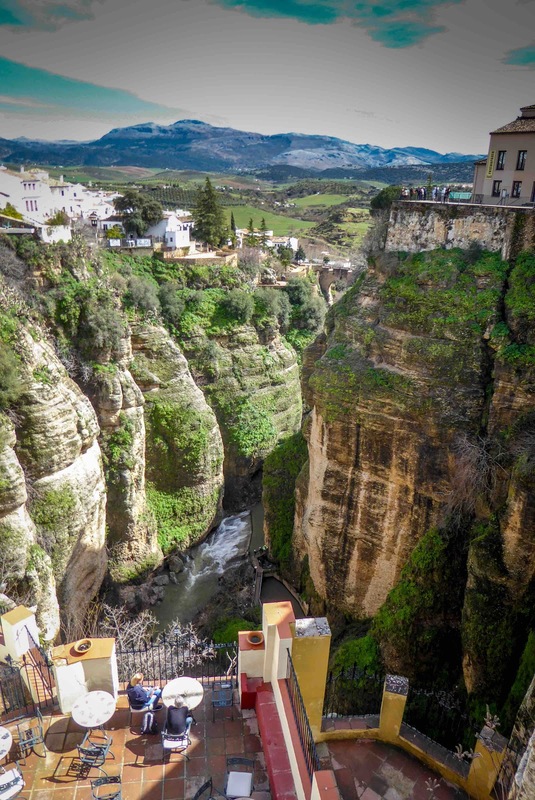 Essentially it's one old square with a bridge over a breathtaking gorge. Drew included a stop here during one of our rides and it was a great way to visit. 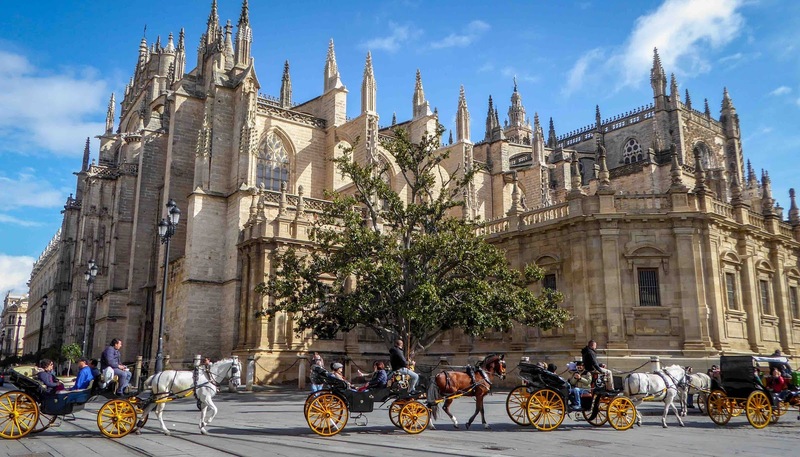 Yet again, there was a overwhelming number of tourists even in March. So what about Granada? The big tourist attraction here is the Alhambra, but I discovered tickets must be bought a month in advance. Plus Liz had told me to leave something to do with her. So that will have to wait. Next, I'll write something about the cycling which really was very good.